I wrote this book in 2011 and one of the beauties of it is that you can open it randomly and receive little gems to start your day, or go into meditation with an inquiry or think about on your way to work. 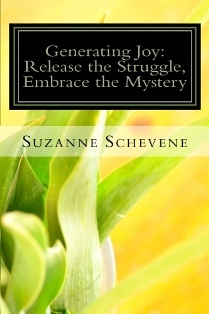 It provides a wonderful pathway towards opening yourself up to a deeper understanding of who you are. Available on Amazon or at your local Book Seller. I've hand-crafted and hand-blended these kits to meet my needs at various times and the needs of my clients and customers. Some specifically compliment the energy work I offer (such as the Heart & Soul Kit with the Foundational sessions of the EMF Balancing work) and others are designed as independant kits. In any case, all of the kits provide valuable support for evolving yourself and continuing on your path whether you use them as a stand-alone product or in conjunction with other modalities. I'm always open to hearing about products you wish you had, so let me know if something comes to mind. Be well. Live life. Find passion. Please note: I've removed the misting kits for the time being, so at this moment I only offer one kit. But that will change shortly. :) Thanks for your interest. This kit is specifically crafted to help awakening individuals who are ready to follow their deep inner urge to create what truly matters. Used individually or all together you will be supported to open the flow of communication within your Self to express and create more of the things that you desire, whether it is a peaceful environment, a business launch or a more balanced lifestyle. Inspired Action to move forward with an aliveness and full expression of your Self. An interesting thing about essential oils is that your favorite will change all the time. You will be drawn to what you most need in any given moment, so what feels neutral to you today may be passionately attractive tomorrow or next week or next month.4-10 ml roll-on blends with meridian & reflex point application information. To read more about the individual blends, follow this link. To learn more about aromatherapy go to The Basics page or Archives & Resources. To learn more about EMF Balancing Technique follow this link to the sister site. 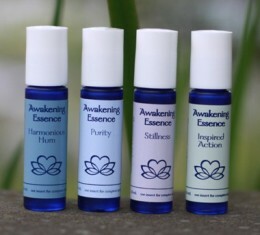 © Copyright 2019 Awakening Essence Aromatherapy . All rights reserved.